The Mirage 3 is a flexible, responsive shoe with a smooth ride and a touch of cushion. It’s a great option for everyday training and its low weight also makes it well suited for speedwork and racing. Neutral to mild overpronators looking for a lighter weight shoe with a more minimal feel that encourages a midfoot strike pattern with a softer feel and a touch of support. The Mirage 3 is the latest addition to Saucony’s Natural Motion Series, and saw significant changes in this update. Shedding a full ounce, and featuring a more flexible sole unit, softer cushioning, and a 4mm heel-to-toe drop, the Mirage 3 is light and fast, but still provides a touch of support. The Mirage 3 performed well on roads and the track, and is meant to be a hybrid shoe, blending more minimal elements, such as a lighter weight and a 4mm heel to toe drop (to encourage a midfoot strike), while still maintaining some support elements. It’s a good option for neutral runners or runners who have mild pronation issues that are looking for a lighter, more minimal shoe. After struggling in more heavily cushioned shoes, I began looking for a slightly more pared-down option. 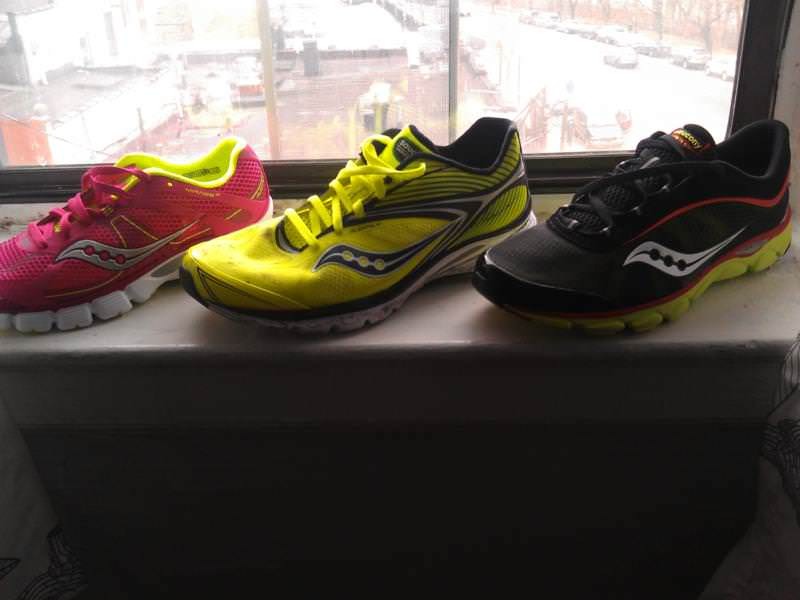 I began with the Saucony Kinvara, and liked the fit and ride, but with a history of stress fractures, I found that I needed a little more cushion. The Mirage 3 seemed to fit the bill with its soft feel, lighter weight, and low heel to toe drop, so I was excited to give them a try. I took them out for their first run the day after they arrived. Immediately, I knew that I had found was I was looking for in a new shoe. The ride was smooth like the Kinvara, with that extra bit of cushion that I had been missing before. I loved the snug fit, and I felt like I had been running in them for years from day one. While the Mirage 3 most definitely offers a softer ride than the Kinvara (and its predecessor, the Mirage 2), it doesn’t have the heavy cushioning and thicker soles of more traditional shoes like the Ghost 5 and the recent Adidas Boost. 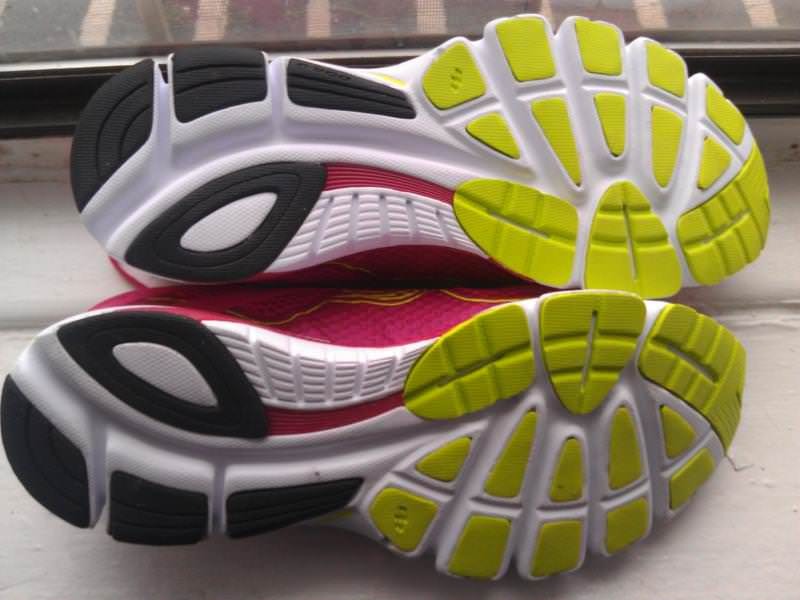 As a neutral runner, I didn’t notice the guidance elements in the shoe, which I was initially concerned about, so the Mirage 3 probably would not be a good choice for runners with serious pronation issues. Mirage 2 users will see the most changes in the sole unit. One of the biggest issues that Saucony addressed with the Mirage 2 was its stiffer harder sole. The Mirage 3 is extremely flexible, and offers a much softer ride than its predecessor. As a result of the increased flexibility and softness, the Mirage 3 is more responsive, and allows the runner to feel the road. To achieve the additional flexibility, Saucony added a groove along the outsole, bringing the total number from three to four, by reducing the size and making the grooves deeper than in the Mirage 2. In addition, the plastic supportive insert on the bottom of the sole was made smaller, to add additional flexibility. As a more natural shoe, the Mirage 3 is intended to help runners achieve a midfoot strike. In addition to the more flexible sole, the Mirage 3 has two main features that encourage midfoot strikes: a 4mm heel to toe drop and a beveled heel. A smaller heel to toe drop makes a midfoot strike pattern easier because the flatter platform allows the foot to land evenly. The beveled heel on the Mirage 3 also adds to the flatter foot position. The Mirage 3 would definitely fall in the middle ground between traditional running shoes and barefoot-style shoes like Vibram Five Fingers and other non-cushioned shoes. Instead, it allows runners that feel they need some cushioning and support to run in a shoe that encourages a midfoot strike. For me, this balance has worked extremely well, and I’ve loved running in the Mirage 3. The upper unit of the Mirage 3 is smooth, light, and snug. 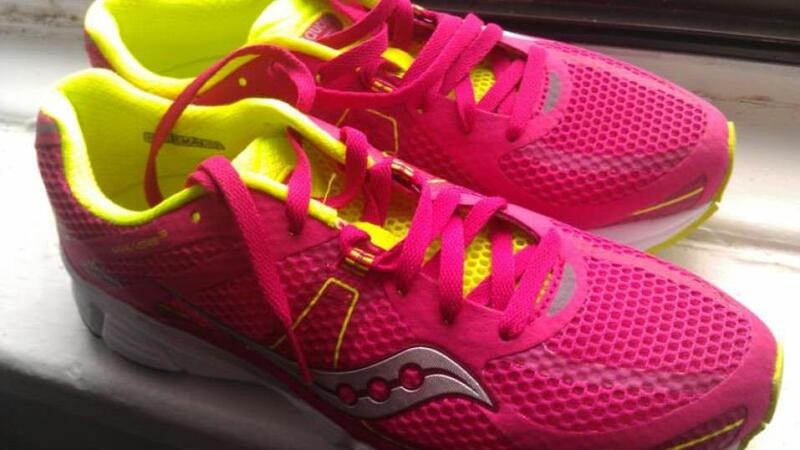 Saucony used its FlexFilm technology, which is applied using heat, for the overlays, which not only creates a smoother upper, but also helps to lower the overall weight of the shoe. The upper mostly consists of mesh, with the FlexFilm applied around the toe and along the sides. Rounding out the upper is a bit of cushioning on the collar for additional moisture wicking and comfort. The upper hugged my feet nicely, and I found that the toe box had plenty of room, even with thicker winter-weight socks. In general, the upper performed very well, and I loved the smooth, snug feel. While shoes that are completely waterproof are difficult to find outside of the trail category, I found that they held up as well as expected in rainy conditions. Running through some deeper puddles and steady rain did result in wet feet, but no more than I’ve experienced in other shoes. I was most impressed, however, to see just how quickly the Mirage 3 dried. After a particularly rainy morning run, I put a little newspaper on the inside and left them near my desk, and by lunchtime four hours later, they were completely dry and ready for the next run. I’ve loved the Mirage 3, and it’s a great option for runners that are looking for a middle ground between traditional stability or neutral shoes and the more minimal options available. Most telling, for me, is that I never noticed them on the run—they simply did their job without forcing my feet into a different position and allowed me to feel the ground. The outsole did seem to wear down faster than expected, but otherwise, there was little for me to complain about with these shoes. Some Mirage 2 users may find that the upper is slightly tighter in this iteration, and the outsole is softer and more flexible, so those that liked the firmer sole on the Mirage 2 or have wide feet may want to take the Mirage 3 for a test run before purchasing. As a runner looking for a more natural feeling shoe, the Mirage 3 has been a fantastic shoe for me: it provides the cushioning I need and the flexibility I’ve been looking for. We thank the nice people at Saucony for sending us a pair of Mirage 3 to test. This did not influence the outcome of the review, written after running more than 50 miles in them. Nice review! Do you think these are supportive enough for a slight overpronator, 156#, 5’10” guy running a half marathon? I’m doing the Portland Half October 6, so I’m hoping for a quick response. Thanks! FYI the Men’s Grey/Green/Citron Mirage 3’s are currently on sale at Costco for $50. Less than the $82 on Saucony.com. Just got them today and noticed that they are definitely more sung in the fore/midfoot than the Guide 5/6 that I am used to, but plan to use them for runs less than 10 miles. I’ve run a few marathons in the Guide 6’s without problems so hopefully there is enough stability for a moderate/severe overpronator like me. Mirage 3 is my most recent purchase – it definitely gives quite a bouncy and softer feel than the Mirage 2. The shoes is best suited to race with and on track for slight/moderate pronators who are forefoot/midfoot strikers. I tend to rotate the Mirage 3 with Brooks ST5 Racer (still an excellent shoe) for races. Still not fully confident to race on longer distances beyond 10k with it – I would not suggest it to heavy strikers and people weighing beyond 175 lb. The Brooks Ghost (with insoles) is my choice for long runs while Brooks PureFlow (which actually felt better than the Cadence, hence my choice) would be used for track and recovery sessions. The Mirage 2, given its stiffer sole is better suited for recovery and tempo runs on roads/pavements. I tend to have wide feet – Mirage 3 is still fine for people in this category, though not as much space in the toe box as Pure Flow and the Ghost. Hi Courtney, I’m currently running in Pegasus and Asic DS trainers and would like to try a transition shoe that I could also use for speed/tempo work (once I get used to running in them, I plan to transition slowly). Would you recommend the Saucony Mirage or the Nike Free 5.0? The Free 5.0 has a higher drop than the Mirage so I’m leaning towards them but I tried them on in the shop and I’m not sure I liked the high arches; is that a feature I will get used to? Or would the Mirage be a better choice for me? Not sure where in Gold Coast Australia I can find a pair of Mirages to try on either. Thanks in advance. A question here about the stability elements. I started running 5 years ago at 260lbs and thusly wore the biggest beast of a stability shoe there was. Down to 190 now I’ve been slowly walking down the stability/motion control ladder. Most recently moving from the Hurricane 14s to the Guide 6. Training for Chicago Marathon and I’ve got about 250 miles on my Guides with no appearant ill effects. Need to buy another pair of shoes to throw into rotation and considering stepping down to Mirage, after your testing would this at least seem to be a logical/plausable sounding move? The stability elements are pretty minimal–I’m typically a neutral runner, and haven’t noticed them in the few months that I’ve had in them. You’ll definitely notice a step down in stability, but if pronation is no longer an issue for you, they could be a good transition. With marathon training, your miles will start to pile up pretty quickly, so it’s important that you’re rotating the new shoes in slowly, so you don’t shock your body. It’s always a good idea to hit your local running store to give them a test run and have them film you and assess how you run, just to be sure that it’s the right fit for you! 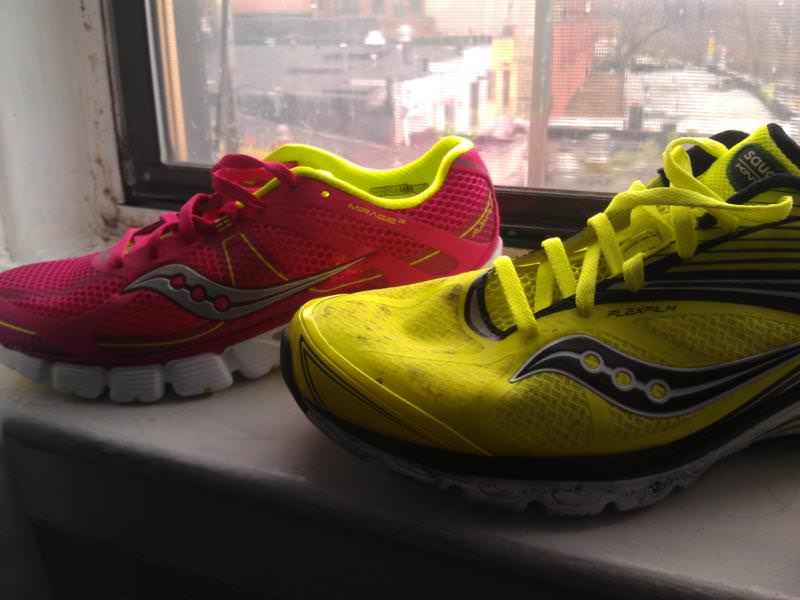 Additionally, I’d check out James’s post on transitioning to minimalism, for a little more guidance (http://www.runningshoesguru.com/2013/04/10-tips-for-new-minimalist-runners/). I currently run in the Guide 5’s and am in the market for a new shoe with a little less stability. Do you think the Mirage 3’s would be a good shoe to transition into? Absolutely. I actually tried these as I was transitioning from the Brooks Ghost. I tried the Kinvara (which is a bit more pared down than the Mirage) first, and found that I needed a little more cushion. The Mirage definitely hit that sweet spot for me! Good luck with your transition! You may also want to check out James’ post on transitioning to minimal shoes for more tips: http://www.runningshoesguru.com/2013/04/10-tips-for-new-minimalist-runners/ as well! I am not a very experienced runner, but I have a question. I keep hearing about the durability factor, but no one has really said how long the shoe will last. How many miles will this shoe last before needing replacement? Also, if I run alot on a treadmill and occasionally outside (concrete), could they last longer since the friction would be less on a treadmill? I’ve put about 100 miles on my test pair so far, and I am noticing that the outer rubber, which provides traction and also protects the foam, is wearing down pretty significantly. I do most of my running on rougher concrete or trails, so I imagine I’ll be able to get another 100-150 miles on them, which is on the lower end for me. If you’re doing the bulk of your running on the treadmill, I would imagine that you’ll get a little bit more wear out of them, since it’s a smoother surface than the concrete that I find myself on. If you’ve liked the Peregrine, the Mirage or the Kinvara could definitely be good fits for you, since they both have a similar fit. The Kinvara is probably a bit closer to the Peregrine, but if you want a little more cushioning, I’d go with the Mirage. I’ve been training in the Mirage almost exclusively since testing, which is rare for me, and they’ve been great for me–I run mostly on roads and the occasional dirt/gravel park trail this time of year. As always, I recommend giving them a test-run at the store before purchasing. Hope this helps, and best of luck with your upcoming half! Great reviews! 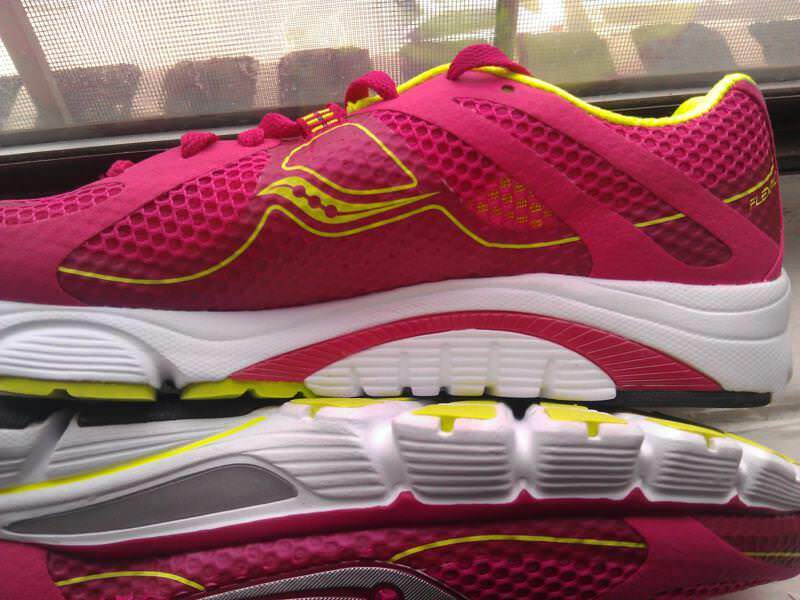 I’m trying to decide between the Saucony Mirage 3 & Mizuno Elixer 8. I’ve tried out the Enigma & liked it but have been running in the Saucony Peregrine 2s so am a bit used to the lower drop. Earlier this year ran in the Mizuno Precision but don’t really like the new fit (I might be the only one). Also, wondering if either Elixer or Mirage are good for regular training. I’m running between 20-25 mi/wk, training for a half-marathon, or if the Inspire might be better. I liked the Peregrine fit but need a good road shoe now (was running mostly on trails) that is very responsive but has cushioning too. Thanks! Nice review on the Mirage 3’s. Would you recommend these for a half to full marathon distance run? Currently looking for options since I don’t think it’s a good idea to do those distances on minimus zero’s. lol. It would depend on your running style/history, but for me, they’re definitely shoes that I would consider for a half or a full. If you’re more accustomed to the Minimus Zero, and are just looking for a little more cushion, I’d also check out the Kinvara or the Virrata (reviews from Brian on both of those coming soon). 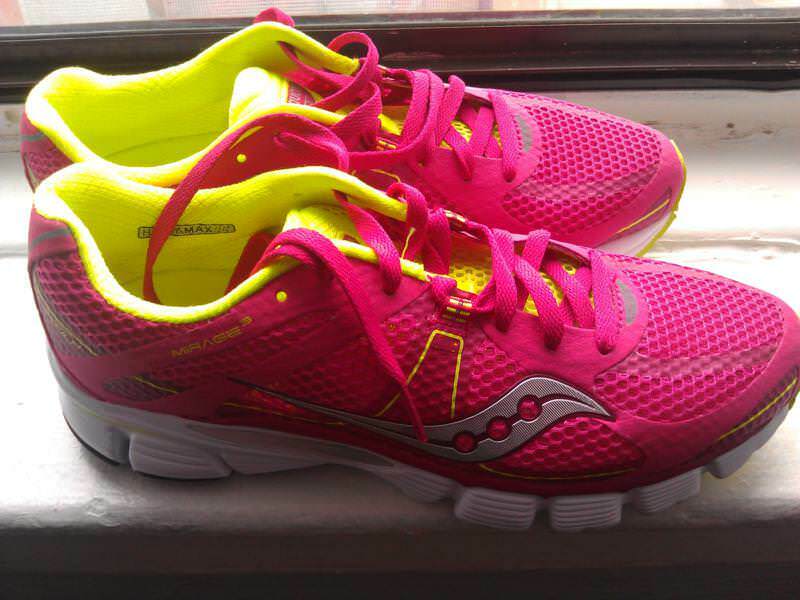 They’re also from Saucony, and are similar to the Mirage, but don’t have quite as much support. The Virratas also have a zero drop, so they could be a pretty easy transition for you. As always, make sure that you’ve worked your way into new shoes before race day! I’ll be waiting on the Virrata reviews, and decide which of the 3 I’ll be picking up for half to full distance run’s. 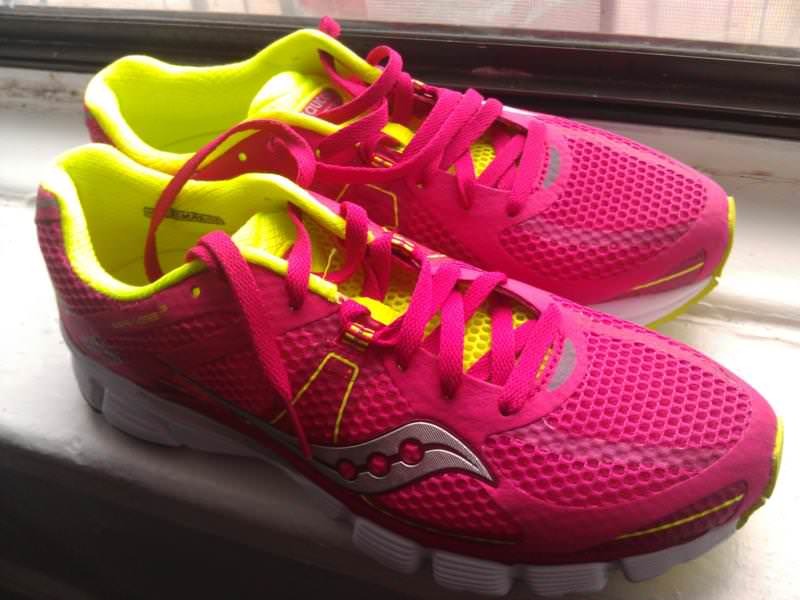 never tried a Saucony shoe so this will not be a rating but a complain for the company. Saucony shoes keep getting good reviews, but in all there is an issue about sole durability ( I can also remember an upper dupability problem with the kinvara 2 that seems to be fixed)! Further more the shoes are not low priced so one can get a descent miles/price ratio out of them. I believe Saucony could easily build more durable shoes just by adding fraction of weight in their shoes (that noone would even notice). After all the Kivvara or the Mirage are not elite racing shoes where everything counts. And have many-many more satisfied customers! I’m afraid i’ll never use a pair of Sauconys as long as this issue excists. Sorry but i can not afford to change shoes every second month or so. I agree. I have the Mirage 2, bought several pair all at once because I loved the ride so much, but these shoes are made of chocolate! The tread begins to wear off visibly by the second run. By about 4 runs the tread on the high wear areas for me is totally gone. I am now applying stick-on heel protectors and coating the sole with shoo goo to get some level of durability. If you don’t mind buying a new pair every 30 days then enjoy these shoes. FYI I am a seasoned runner and usually get about 2-3 months of running on a shoe before the tread gets bad.